Canada's 1st Parachute Battalion earned a fearsome reputation on D-Day and in the two months of grim fighting that followed. It jumped again in the Rhine crossings, and fought its way deep into Germany by VE-Day - only to be disbanded soon afterwards. In the post-war era soldiers struggled to keep airborne skills alive until an ambitious new Airborne Regiment was raised in 1968. Since its controversial disbandment in 1995, the airborne torch has been carried onwards by the Parachute Companies of three Canadian infantry regiments who have recently served in Afghanistan. 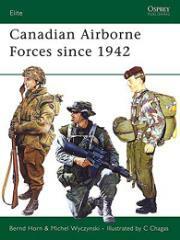 This book details the fascinating history of the Canadian Airborne forces.